Ever wondered what exactly an agile office fit out is? The term has been floating around in the interior design world for a while now, and as with all trends, people are rightfully wondering whether or not it will stick around, or be replaced with something else. In either case, it’s the most cutting-edge way of organising an office space that’s currently available to us, so it pays to understand it if you’re interested in switching over or feel that you have an opportunity to revamp your office in the near future. Typically, an agile office achieves greater freedom of movement and maximal use of space by not assigning seats to employees and instead creates task-based workspaces. The agile office is also built on the foundational understanding that staff should have spaces that facilitate both privacy and collaboration. In short, an agile office fit out is a combination of different ideas, and we’re going to go through the five most important ones in today’s blog. Physical freedom lets your staff work together quickly and easily, reconfigure desks as needed, and allows you to optimise the office for the available natural light. There are drawbacks, of course – such as increased background noise – but the central principle of agile office planning is to add together the positives of various planning methods and mitigate, if not eliminate, the negatives. That leads us to breakout areas – spaces designed for groups that need to ‘break-out’ of the conventional work environment but are less confining than a conference room. They could take the form of smaller meeting rooms, booths, living-room style areas, etc. Breakout areas are ideal for impromptu teamwork but don’t quite fit the bill for sustained, solitary focus. With that in mind, let’s take a look at the next point on our list. Quiet zones are small, individualized spaces around your office that are designed to serve those who need to tackle tasks which require extensive concentration. They’re ideal for extended focusing, taking private calls, or making one-on-one video conferences. 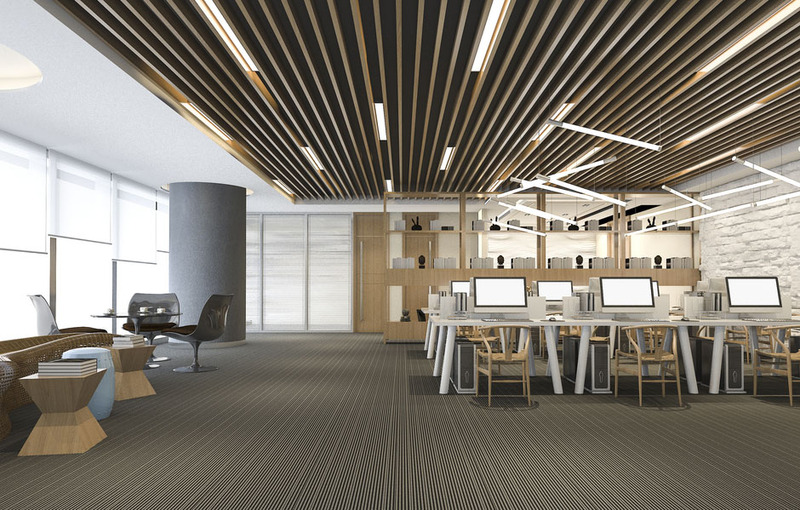 These areas are great for balancing out the open floorplan with more private areas, and so are generally soundproofed, or otherwise removed or separated from the main area in your office. Touchdown spaces are great for employees who don’t need to be present in the office every day, or spend a lot of time seeing clients out on the road. They could take the form of bar stools on a counter, with internet and power connections, or they could be more substantial fixtures, such as couches, depending on your preferences. This makes touchdown workspaces perfect for sending a few quick emails or completing some smaller assignments between meetings. Finally, the fifth important part of an agile office is easy access to resources. In an agile office, making sure everyone has the space and equipment they need is imperative. To that end, you can set up resource stations that let your staff access documentation, printers/copies and so on at the same time. Integrating this into an agile office plan requires some foresight – you don’t want to set one up too close to an area where someone may be distracted by increased foot-traffic. Could an agile-office plan work for you? If you’re interested in pursuing an agile office fit out, it doesn’t have to be a massive investment; with the right guidance, you may even be able to achieve some amazing results with what you already have. With over five decades experience, DB Interiors is an interior designer Auckland trusts. Give us a call today, and we can book you in for a free consultation to help you figure out what your next steps are for getting the most out of your office and boosting your office’s efficiency.